Anyone from Melbourne, Australia? 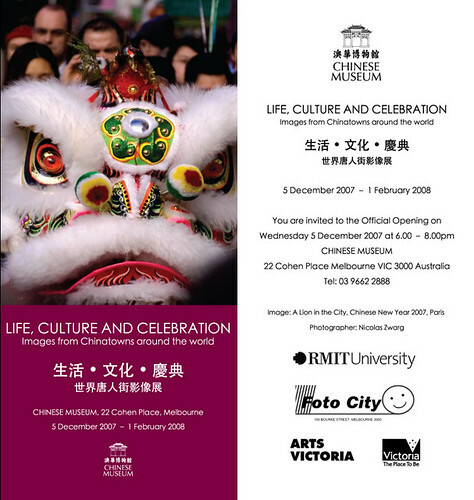 I have four photos to be shown at the Life, Culture, and Celebration: Images from Chinatowns around the world exhibit, and would love to have someone visit and tell me about the experience. Thanks! I was contacted via email of the Chinese Museum’s interest in some of my Chinatown photos in Flickr, and was invited to submit entries for the exhibit. I did, and four of the five photos were chosen. End of story. wow, congratulations! my turn to tell you that i’m happy for your success as a photographer! kasi last week you left a message in my multiply congratulating me for being engaged. i’m congratulating you too, but for a different reason naman. di vah?